a scientologist learns through feedback during auditing and feedback from the E-meter to exert control over the semi-automatic mechanisms that control enough membrane bound ion channels to change their body resistance enough to provoke a measurable response in the E-meter. It is biofeedback in its most basic sense. Martin Hunt, an ex-Scientologist and auditor, also believes that biofeedback mechanisms are at work here. According to Thomas J. Wheeler, biofeedback that involves "measurement of muscle tension and skin temperature (higher temperature associated with relaxation)" is not controversial. Such techniques "have been incorporated into many treatment programs." The electrical changes measured by an e-meter may be directly related to changes in one's thoughts or mental images, but what significance or meaning one gives to these changes in electrical resistance - beyond basic principles of biophysics - is arbitrary and subjective. The meaningfulness of the connection between the electrical resistance of a human hand or fingers and mental images is taken on faith. Belief in the e-meter's capacity to tap into the depths of the soul might be the best proof that Scientology is a religion; for, it requires a belief contrary to everything science has taught us about electricity and the brain. According to the Church of Scientology, the e-meter is a "pastoral counseling device" that helps locate "spiritual distress or travail. "* The e-meter is also used as a recruiting device. For example, at the Downtown Plaza in Sacramento, California, Scientologists rent a kiosk for $2,000 a month. They offer free "stress tests" to passersby. 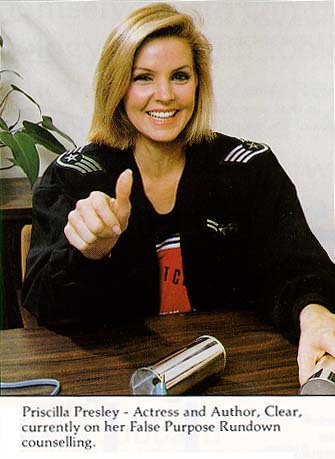 The stress test consists of the test subject holding the cans of an e-meter while a Scientologist asks such questions as "What causes you stress?" The Scientologist then interprets any changes in the e-meter's readings. Scientologists believe the meter can gauge energy in the body and read spiritual trauma through a process called auditing. By addressing that trauma, people can neutralize these charges, they say. Working their way through stages, they eventually reach a state they call clear. Scientologists believe auditing, using the E-meters, is a guide to self-discovery. When the E-Meter is operating and a person holds the meter’s electrodes, a very tiny flow of electrical energy (about 1.5 volts – less than a flashlight battery) passes down the wires of the E-Meter leads, through the person’s body and back into the E-Meter. The electrical flow is so small, there is no physical sensation when holding the electrodes. The pictures in the mind contain energy and mass. The energy and force in pictures of experiences painful or upsetting to the person can have a harmful effect upon him. This harmful energy or force is called charge. The above explanations are based on pure speculation. There is no concept in physics or neurology of the mass and energy of a mental image. This is not to say that thoughts don't have physical effects. They do, of course, but it really shouldn't be much of a revelation to find out that when one thinks of the most upsetting thing of the day that it has a negative physical effect. Finding a reading on a meter while having a thought or feeling is little more than a stage prop, a bit of theater to make the process of telling you what you already know seem magical and scientific. An interpretation in terms of engrams, the reactive mind, and other jargon just adds to the theater and makes the process seem more plausible than it really is. This disclaimer is in response to a 1971 ruling by the United States District Court, District of Columbia, that declared: "the E-meter has no proven usefulness in the diagnosis, treatment or prevention of any disease, nor is it medically or scientifically capable of improving any bodily function." This ruling came after nearly a decade of legal wrangling with the government over concern "that the devices were misbranded by false claims that they effectively treated some 70 percent of all physical and mental illness" (Janssen 1993). 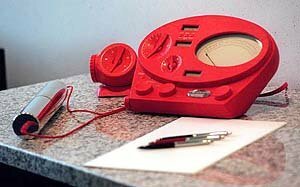 Nevertheless, Scientologists continue to use the e-meter in auditing, although some models are designed for ease of use by a single person, presumably to help with their spiritual development. The Church is careful not to claim publicly that the e-meter has any health benefits. Some Scientologists, such as John Travolta and Priscilla Presley, say they use the e-meter on a regular basis. Any value the device has comes from the subjective validation of the user, however. It is not difficult to see how such a device could provide comfort to people, especially if they believe that thoughts have mass and energy (but they are not talking about anything neurological) and they are very creative. For such people, the e-meter could well be useful for self-discovery. The e-meter readings can stimulate such folks to reflect on their thoughts and actions, which may lead to active planning for the future. The process could be an assist to self-hypnosis, psyching oneself up with confidence and determination. With a little communal reinforcement, it is easy to see how one might come to believe that a device that measures nothing but electrical resistance could actually provide useful information about what one fears and what to do with one's life. Add trust and it is not too hard to understand how many otherwise bright and creative people would let someone interpret an ohmmeter as if it revealed something important about the human soul. See also confirmation bias, radionics, Dianetics, and The Sound of One Mouth Blathering (1996) by Robert T. Carroll October 22: a review of The Rediscovery of the Human Soul by L. Ron Hubbard, 1996..
Quack "Electrodiagnostic" Devices by Stephen Barrett, M.D. Scientology and Its E-Meter, from Chapter 23, "The Gadgeteers" by Wallace Janssen (pp. 321-335) in Stephen Barrett, M.D., and William Jarvis, Ph.D. (editors), The Health Robbers, Prometheus Books, Buffalo NY (1993). "Attention shoppers - Scientologists hail mall-goers to offer stress tests on E-meters" by Jennifer Garza Sacramento Bee, July 23, 2005.